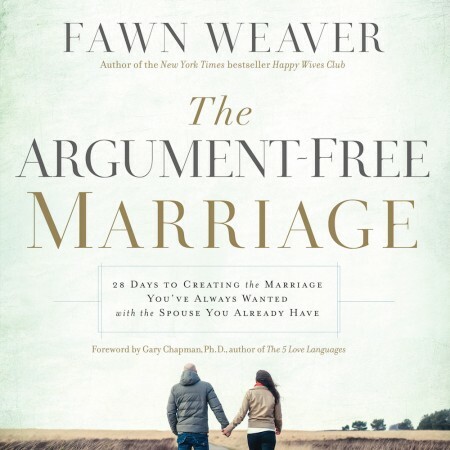 In this book Fawn Weaver does a great job presenting her ideas for creating an argument free marriage. However, this book isn't a Christian book and shouldn't be sold as one. I made it 3/4 the way through the book before I had to throw in the towel. All throughout the book is references to Whoopi Goldberg and Rosie O'donnell, both of which I do not believe are good role models for Christians to follow. Additionally, Fawn Weaver claims that she and her husband have never had an argument in their 10 years of marriage. The key to this is explained later on when she confesses that she doesn’t define what an “argument” is the same way as most people do. The book is riddled full of stories of the past arguments her and her husband have had, and then she still assures the readers that she hasn’t ever had an argument with her husband.